Resupplied food, ate empanadas, and wandered the streets of town – didn’t head out until 3:00. J&E were taking so long that I jumped on my own bike in hopes of getting out of town earlier. It rained a bit heading out of town, but soon cleared up. Roadside lakes, mild climbs and steep rivers cutting narrow canyons through the rocks. Wouldn't want to fall down there! Road felt less travelled and more remote than days passed. 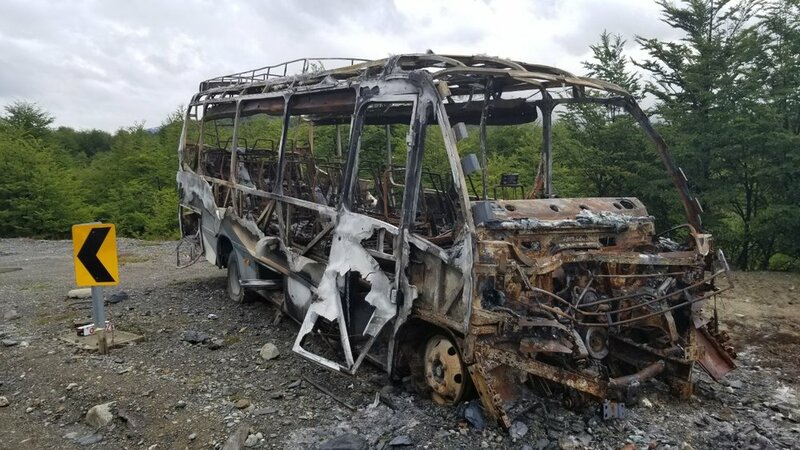 Passed burned-out bus. I loved the screaming downhill winding beside a narrow and steep canyon and tumultuous rapids. Passed a Russian couple with a one-year old baby boy off an a many-month adventure. Found a beautiful campsite in the wide valley below, mountains and waterfalls and ominous clouds in all directions.